Microsoft has confirmed that it will be using the Xbox and its Bing search engine as a way to hammer home the message about its Windows Phone 7 product. Windows Phone 7 represents a huge push from Microsoft back into the consumer phone market – and the software giant is prepared to leverage some of its most successful brands to make it a success. That will include hawking Windows Phone 7 apps and phones through the Xbox platform, and using the visual search of Bing to push its wares as well. "It's no accident that Microsoft has been more visible than usual," explained Microsoft's Todd Brix. "The holiday shopping season is a major focus for us, as evidenced by Windows 7 and Bing campaigns as well as the introductions of exciting new products in Kinect for Xbox 360 and of course Windows Phone 7. "We're heading into one of the biggest shopping weeks of the year and we're on pace to offer roughly 3,000 apps and games by the end of this week. "We've also seen a near 80% increase in the number of registered developers since September, with more than 15,000 developers already signalling their intent to bring exciting content to Windows Phone. Clearly we're just getting warmed up." The blog post outlines several ways in which Windows Phone 7 will be pushed, ranging from the obvious (ad campaigns and the windowsphone.com website) through to the Zune PC software. 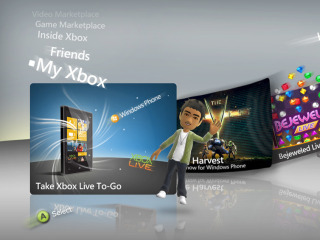 But it will be the visibility on the Xbox user interface and on Bing that will raise eyebrows. "Last week Microsoft announced that it had sold more than 1 million Kinect devices for Xbox 360 in the first 10 days of availability, adding to the 45 million Xbox 360 consoles already sold," added Brix. "Windows Phone devices, apps and games are now prominent features of the Xbox dashboard that people see on their televisions when they start Xbox and view tabs such as the Spotlight category." Bing's visual search will be leveraged to push the apps as well: "We're using our own popular Bing decision engine to further showcase developers' Windows Phone 7 apps through Bing's Visual Search capabilities in the US and UK. "This allows anyone with a browser to easily find, view and access the growing list of apps and games available for Windows Phones." It represents a hefty slice of what marketing bods call "joined-up-thinking" from Redmond – but will it be enough to push Windows Phone 7 to success?